ZoomChess adapts to the student, and individualizes what they see next. With a curriculum divided in over 150 subject areas, ZoomChess discovers where students have developed proficiency, and where they need help…and delivers activities at their level. Zoomchess covers all aspects of Chess. It contains thousands of learning activities for students ages 4-18. ZoomChess measures and responds to your child’s individual strengths and weaknesses. Students progress at their own pace, and master concepts before moving on. ZoomChess outpaces book learning and classroom learning by a wide margin. Because students can learn a concept, practice it, and master it with instant feedback, instant board set-up, and at a level that is “just right” for that student. When it comes to learning new chess concepts, ZoomChess is like having a chess coach available 24 hours a day! ZoomChess has more animated lessons than any chess product in the world. The talking teacher reads instructions, gives hints, and explains concepts. Even when the student’s answer is wrong, the messages stay positive! ZoomChess is committed to providing the world’s leading kids Chess resource at an affordable price. 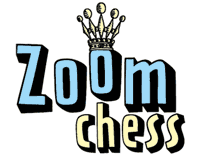 You can have a year on ZoomChess for less than an hour with a private coach.